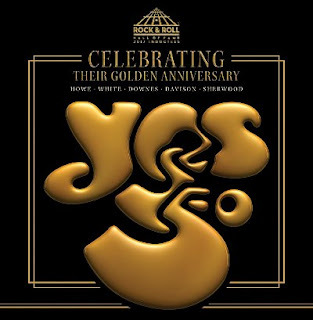 Yes, one of the biggest bands in prog rock history and true pioneers of the genre, today (March 26) revealed the dates and details for this summer's 50th Anniversary North American tour titled #YES50: Celebrating 50 Years of Yes. Tickets for the 30-plus date outing, which kicks off June 5 and 6 with a two-night engagement at the Arcada Theatre in St. Charles, IL, will go on sale to the public beginning this Friday, March 30 or Saturday, March 31, with select shows going on sale in early April. A handful of additional dates will be announced soon. "Much has changed since I joined Yes in 1970, but the core elements of the band have remained consistent," shares guitarist Steve Howe. "We want to mark this anniversary with a tour that encompasses some of our best-loved work and revisit a few classic pieces that have been lost for a while. We look forward to sharing the 50th anniversary with the fanbase, playing classic songs that celebrate the broad musical style of Yes." "I have been blessed to be a member of this amazing band's rhythm section for the past 46 years, mostly in the company of my great friend Chris Squire, and latterly alongside Chris' chosen successor, Billy Sherwood, who is receiving recognition for stepping into Chris' pre-eminent bass and vocals," says drummer Alan White. "Each night we are pausing to reflect on Chris' importance to Yes, his desire that we should continue to share Yes music on stages worldwide, and the specific dedication of 'Onward' to his huge memory. I'm so grateful to continue to be performing on stages for our dedicated fans and look forward to celebrating our 50th Anniversary in America. It has been a great ride!" "Being a member of the band during its 50th anniversary is a privilege and honor," adds Geoff Downes (keys). "It is awe-inspiring to reflect on the caliber and invention of the musicians who have forged the legacy of Yes since 1968, always pushing the boundaries. Playing on stage with founder member Tony Kaye to launch the 50th anniversary [on this year's Cruise to the Edge] was a wonderful experience for the band and our fans, to whom we dedicate this special tour." During this summer's "Evening with Yes" shows, Yes, Steve Howe (guitar since 1970), Alan White (drums since 1972), Geoff Downes (keyboards; first joined in 1980), Jon Davison (vocals since 2011) and Billy Sherwood (guitar/keyboards in the 1990s and the late Chris Squire's choice to take over bass/vocals in 2015), will perform a special classic hits concert to commemorate the landmark occasion. The cross-country trek will take the 2017 Rock & Roll Hall of Fame inductees to Kansas City, Denver, Los Angeles (June 19 at the Ford Theater), San Jose, Detroit, Cincinnati, Pittsburgh, Boston, Staten Island, Philadelphia, Washington, DC and Orlando, among many other cities, before wrapping July 28 in Atlanta.